In the 1901 England Census provided by Ancestry, the Staffin family was at Rifle Range, Altcar, Lancashire. Rifle Range is a long established Army training facility. The head of the family, George Staffin, was aged 43, he was born at Coleby, Lincolnshire, and his occupation was given as soldier, sergeant with the Royal Garrison of Artillery. His wife Hanora was 31, and had been born in Ireland, as were Robert and George, both aged 7. Matthew was 4, Henry was 3, and Hanora was 2, these last three were all born in Altcar. In 1911, the family were found on the Wales Census, living at Kennel’s Cottage, Talacre, Flintshire. George William was 50, and his occupation was a carter on the estate. He was also described as an Army Pensioner, a sergeant with the Royal Garrison of Artillery. Hanora was 41, she had been married 19 years, and had given birth to seven children, all of whom were living. George was now age 18, and a butcher’s improver. Matthew was 15, and a farm labourer. Henry was 13, Frances was 12, and since the last census Alice 9, and Kathleen 8, had been born. Matthew’s War Service records have not survived, but from the UK Soldiers Died in the Great War, we know that he enlisted at Wrexham, and had formerly been in the Denbighshire Yeomanry, regimental number 955. The Denbighshire Yeomanry (Hussars) was a territorial unit, whose headquarters were at Erddig Road Wrexham, and they trained at Hightown Barracks. Territorial forces could not be compelled to serve overseas, however, on the outbreak of war, many members volunteered for Imperial Service (Denbighshire Yeomanry website). 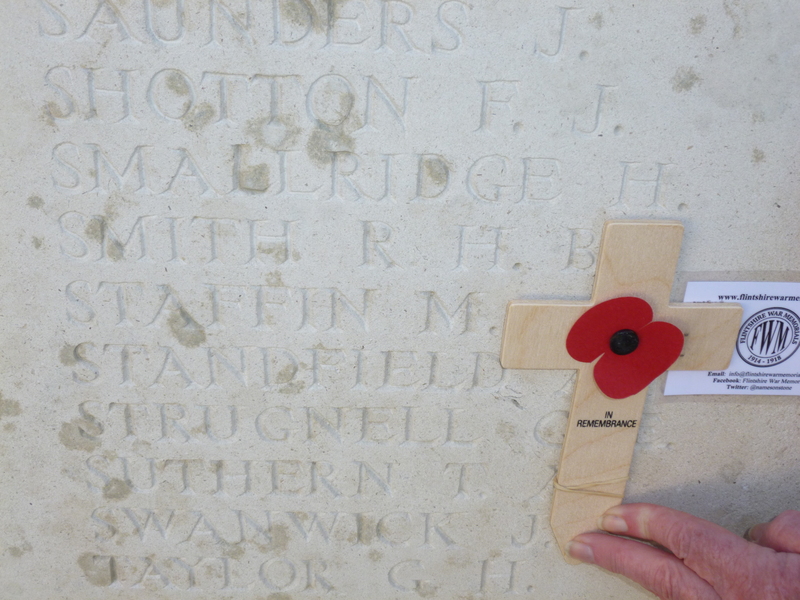 We know that Matthew transferred to the Shropshire Light Infantry. There is a card in the Roll of Honour in the Hawarden archives, which gives more details. It states that he suffered a severe gunshot wound in his back, and that he was gassed on 14th April 1917. This is four months before he was killed. His period of service is written to the exact day, 26th October 1914 to 22nd August 1917. It confirms that he had enlisted in the Denbigh Hussars, and transferred to the Kings Shropshire Light Infantry as an M.G. Probably M.G. stands for machine gunner. After stating that he was killed in action the words somewhere in France are written in brackets. The card is signed G.W.Staffin, father. The medals awarded to Matthew were the British War Medal, and the Victory Medal. There is an entry in the UK Register of Soldiers’ Effects for Matthew, which is for monies owing to deceased soldiers. His father George William and his mother Margaret received a payment of £8 12s in 1917, and a War Gratuity of £13 in 1919. Matthew’s father George William Staffin had a long career in the Army, after retiring he re-enlisted in 1914, and survived the War. British Army Service Records from Find my Past website, show that his first enlistment and attestation was at Sheffield on 9th February 1880, when he was a 23 year old farm labourer. He served in India, Ireland and Seaforth, Lancashire, and was at Altcar in 1901. By 1911 he was an Army Pensioner at Talacre. On the outbreak of war he re-enlisted at Liverpool on 9th October 1914, and was given the number 2692 and the rank of sergeant in the Royal Garrison Artillery. He was then 57 years and 10 months old. Another document states he was 57 years and 370 days old, and his hair was grey. He was medically examined and declared fit for service, and his occupation was given as bailiff for eight years. On 15th October 1914, he was posted to the Royal Field Artillery, with the number 51203, and on April 6th 1915 was promoted to the rank of B.Q.M.S. He had many home postings until 4th September 1918, when he was declared medically unfit at Woolwich, and transferred to the Reserve. He was then 62 years old. George William age 22 in the A.S.C. Robert age 21 in the Royal Inniskillings. Matthew age 19 in the Denbigh Hussars. Michael Henry age 17 in the Royal Welsh Fusiliers. The three girls were at home. The four sons were already in the military by then, although being an Army family they may have been regular soldiers. George was awarded the British War Medal, the Victory Medal, and the 1914 Star. He died in 1928. Sadly, Matthew did not return home. Talacre Hall, where George had worked for eight years as bailiff on the estate, was the home of the Mostyn baronets of Talacre. It remained with the family until 1920, when it was sold to cover death duties. In 1921, it became a Benedictine convent for nuns. From the website Belgian Refugees in Rhyl, we learn that in 1915, the Roman Catholic bishop of Menevia, himself a member of the Mostyn family, visited Talacre to welcome 15 monks and their Abbot, whose abbey in Termonde, Belgium, had been completely destroyed as the German army advanced through Belgium. They came as guests of Lady Mostyn. While they were there, the Abbot died, and was buried at Pantasaph monastery. Talacre – Death of a Belgian abbot. The Venerable Benedictine Abbot of Termonde, Abbot Le Beau, whose monastery was burnt by the Germans, has died at Talacre Hall. He had suffered a long and painful illness, which he bore with heroic fortitude. Since the beginning of the year, the Abbot and fifteen of his community have been guests of Sir Charles Pyers Mostyn, and his mother Lady Mostyn of Talacre, who placed the front part of the Hall at his disposal. – Flintshire Observer October 21st 1915. Lord Mostyn is mentioned as being a great patron of the refugees in other local areas. The Kennels Cottage, where the Staffin family lived, is described as a three storey building, surrounded by kennel yards and kennels. It was approximately 300 metres south-west of the Hall, on the north side of the main driveway to the house from Gronant. In 1987 it was granted Grade 2 listed status. The website “British Listed Buildings” gives comprehensive reasons for this listing. A well preserved C19 estate building of distinctive character, and as an integral component of the extensive outbuildings associated with Talacre Abbey. After the hall was sold to the nuns, it became known as Talacre Abbey. The nuns stayed until 1922, when it was sold into private ownership.